Paul Hegarty has been named manager of the month in Scottish League Two despite his Montrose side facing a play-off to remain in the league. Montrose will take on Highland League champions Brora Rangers after finishing bottom of the table. But they won two and drew one of their four matches during April under Hegarty, who took charge in February with the side already sitting bottom. Montrose visit Brora for the first leg of the Pyramid Play-off final on 9 May. The return is at Links Park a week later. Brora won the first-ever Pyramid Play-off semi-final by defeating Lowland League champions Edinburgh City on penalties on Saturday after two 1-1 draws. 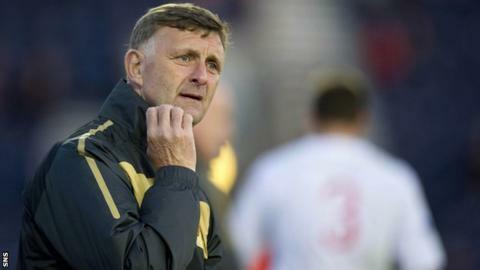 Montrose appointed Hegarty, the 60-year-old who previously managed Forfar Athletic, Aberdeen, Dundee United and Livingston, after sacking George Shields. However, he was unable to prevent the Gable Endies finishing 10 points behind East Stirlingshire.